Archaeological silver objects from burial sites are of a grey-lavender aspect. The formation of AgCl leads to an increase in the volume of the objects, which may undergo a complete transformation into corrosion products. This degradation process has been little studied to date. 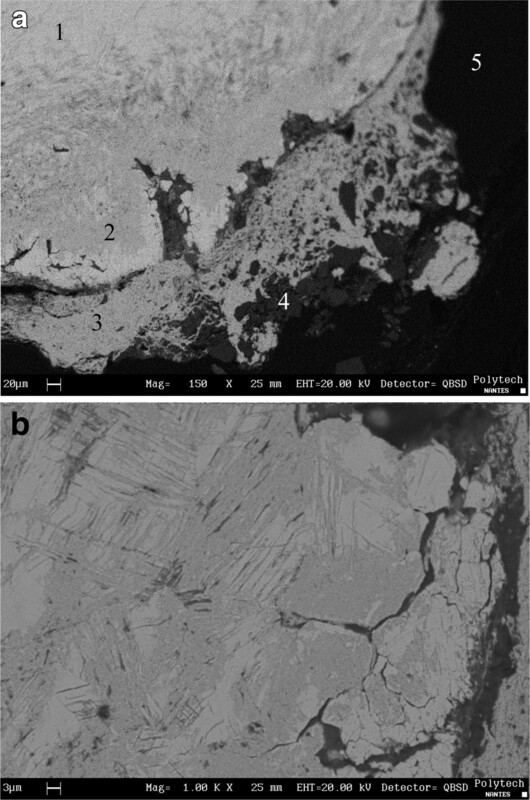 In this paper, eight horn silver objects were studied by SEM and XRD. Analyses showed a corrosion system composed of bi-layers: a compact inner layer and a porous outer layer. Corrosion products were mainly silver chlorides (AgCl), chlorargyrite. Some objects displayed copper inclusions both in the metallic core and in the inner layer. Highly mineralized objects contained other oxygen-rich phases (with Si, Ca) in the inner layer. Soil markers were detected in the outer layer. Based on these results, we put forward a corrosion mechanism for horn silver objects. Silver chloride is formed by the disappearance of the initial silver oxide layer. This AgCl layer is not protective and supports ion transport. Thus an outer layer of silver chloride, incorporating soil markers, is formed. Silver was one of the first metals to be used by humans, and is found in many archaeological objects such as coins, jewellery and ornaments . Silver was often alloyed with copper to enhance its mechanical properties. The best known Ag-Cu alloy is sterling silver (92.5wt% Ag / 7.5wt% Cu), which was commonly used for coins. Its degradation process is well known. Because of low copper solubility in silver, copper-silver alloys are composed of a silver-rich phase and a copper-rich phase . Alteration of this copper-rich phase causes the formation of green corrosion products on the silver object [2–4]. We find pure silver in many precious objects, like jewellery, which are often stored indoors in locations such as museums or churches. The degradation of these objects depends on the presence of pollutants in the atmosphere, a phenomenon which has been widely studied. The atmospheric corrosion of old silver causes a thin film of tarnish to appear [1, 5–7]: these black corrosion products are formed by sulfur pollutants such as hydrogen sulfide (H2S) and carbonyl sulfide (OCS). The corrosion layer is mainly composed of silver sulfide (Ag2S). The deterioration of archaeological objects from marine environments leads to the formation of thick layers of corrosion products and concretions . The mixture of corrosion products frequently separates into two layers. The inner layer extends from the residual metal core to the original surface and does not contain calcareous or seabed materials. The outer layer extends from the original surface out onto the surrounding media. Concretion (a mixture of organic and inorganic calcite and aragonite (CaCO3)) is often only weakly bonded to the corrosion product layer . In marine silver artefacts, the main corrosion products are silver chloride AgCl, silver sulphide Ag2S and mixed silver chloride and bromide AgCl/Br. In aerobic conditions, concretions tend to protect silver artefacts. In anaerobic conditions, the main corrosion product is silver sulphide . When silver objects have remained underground for a long period of time, a mineralization process also occurs. Generally, silver is corrosion resistant. Silver adsorbs molecules of oxygen which are partially converted into oxygen ions (O2–). Combination between metal cations and oxygen ions should result in the formation of an oxide (generally Ag2O) . Silver oxide is outstandingly protective. When humidity is high, more than two layers of adsorbed water are present and electrochemical reactions take place. According to the Pourbaix diagram , Ag2O is stable in mildly acid, neutral and basic solutions. However, chloride and sulfide ions tend to enlarge crystalline defects . Chloride, sulphur and oxygen were detected in a Roman silver artefact buried in soil . In a chloride rich environment, the objects can be completely transformed into AgCl. The presence of AgCl is always associated with horn silver. Horn silver objects are stable and are of a greyish aspect [2, 11]. In the presence of sulfate-reducing bacteria, silver objects contain silver sulfide (Ag2S) and chlorides (AgCl) [12, 13]. North et al. explained this phenomenon by the alternative exposure of an object in a chloride rich environment to an aerobic (AgCl) and anaerobic (Ag2S) environment. In the case of typical archaeological silver objects found in burial sites, the main corrosion products are silver chlorides [2, 12, 14–17]. Silver chloride forms a brittle, finely granular layer. However, unfavourable conditions will result in an object being completely converted into silver chloride. Certain soil components (Ca, K, Al, Si, P…) interact with metal corrosion products . The formation of chlorargyrite (AgCl) in burial environments is still poorly understood . The types and mechanisms of metallic silver embrittlement were explained by R. Wanhill [17, 19–22]. However, for horn silver corrosion there is only a German study from 1979 . The objective of this work is to examine the corrosion products of archaeological horn silver objects from burial sites. Several objects were available for this study. 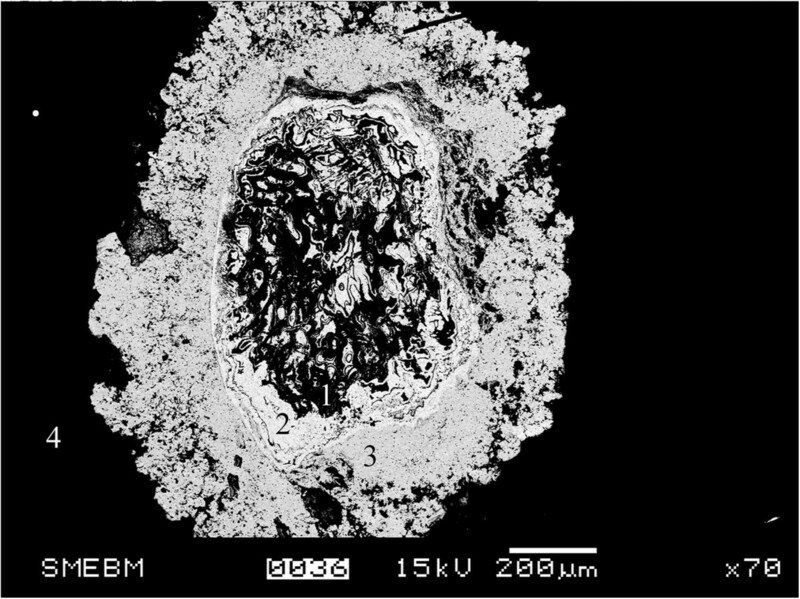 The metallic core and the corrosion layer were characterized by using a scanning electron microscope (SEM) and energy-dispersive X-ray spectroscopy (EDS). Based on these observations, the corrosion mechanisms of horn silver will be presented. The first sample (S1) consists of corrosion products from a late Roman fibula, from Cholet Museum (France). Figure 1 shows the brooch being restored: the engraved decoration is obscured by corrosion products. Archaeological samples (S2 to S7) are silver jewels from Saint Martin’s Church, in Angers (France). They all originate from a single burial site, dating from the early Middle Ages (5th-7th century). Figure 2 shows X-ray radiography of the objects. This technique reveals object details despite the presence of sediments. The final sample (S8) is a small spiral rod from the Gallo-Roman archaeological site of Rezé (Nantes, France). Samples were taken from each object so as to contain the complete stratigraphy (corrosion products and metal core if still present) (Table 1). The brooch being restored (dating from the early Middle Ages (5-7 th century)/Cholet Museum (France)). X-ray photography of the objects (S2 to S7). Samples were embedded in an epoxy cold mounting resin, and polished with series of silicon carbide papers up to 4000 grit and 1μm diamond paste. After polishing, samples were stored in a desiccator. First, samples (S2 – S8) were examined by a Zeiss optical microscope with a 50× magnification objective lens. A Scanning Electron Microscope (SEM) (JEOL JSM5800LV – 15 kV or Stereoscan 440 – 20 kV) was used to observe the morphology of corrosion products, and Energy Dispersive X-ray Spectroscopy (EDS) was used to elucidate elemental composition. Corrosion products of the brooch (S1) were analyzed by X-ray Diffraction (XRD) with diffractometer (X’Pert pro PANalytical) using Cu Kα1 and Kα2 (40 V and 40 mA) in 2Ө configuration. Sample S2 was analyzed at C2RMF (Centre de Recherche et de Restauration des Musées de France, Louvre Laboratory) by μ-XRD with a Rigaku microma×002 tube, a Kirchpatrick-Baez optical and a 2D R-Axis IV detector (45 kV, 660 μA for an incident beam of 200 μm). Figure 3 shows an XRD spectrum of corrosion products in sample S1. The main compound is chlorargyrite (AgCl). Metallic silver was also detected. 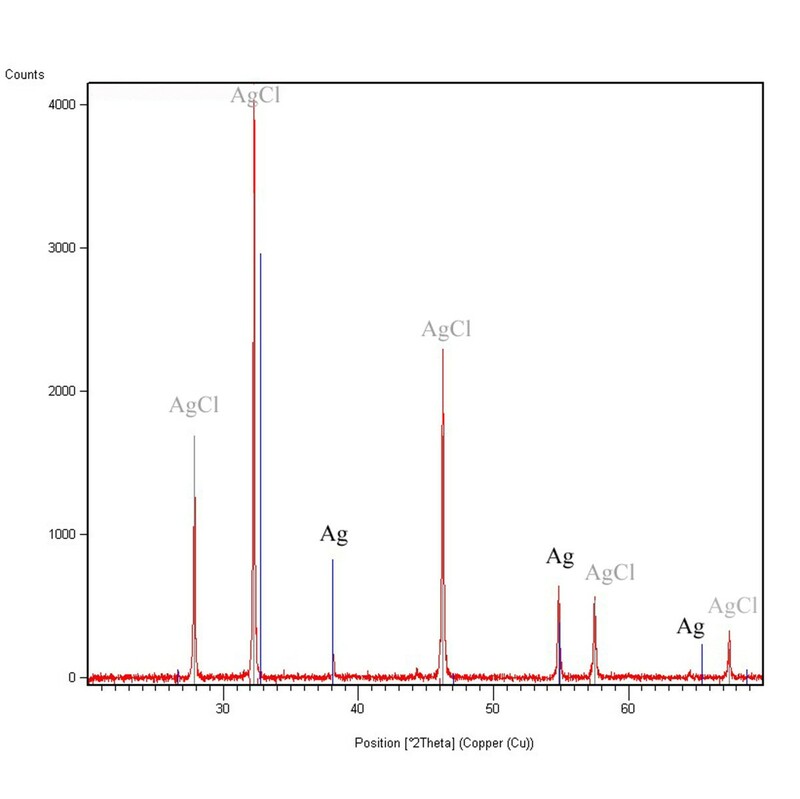 XRD spectrum of corrosion products collected on the horn silver brooch (S1). Green corrosion products are present on sample S5. SEM-EDS analyses show the presence of 3 phases in the metallic core: a copper-rich phase (85at% Cu, 10at% Zn, 5at% Ag), a silver-rich phase (85at% Ag, 12at% Cu) and an oxygen-rich phase (57at% O, 10at% Zn, 5at% Ag). These green corrosion products are probably due to copper corrosion. As sample S5 is an Ag/Cu alloy, it will not be used in the study of horn silver corrosion. In samples S2 and S4, the metallic core is entirely corroded. In both samples, copper was detected in the mineralized core: its level is of 2at% in sample S2, and varies between 2 and 12at% in samples S3 and S4. SEM pictures using backscattered mode (Figures 4 and 5a) show the presence of two phases in the mineralized core (dark and light phases). The dark phase contains a high concentration of oxygen and little or no chloride: 55-65at% O, 10-15at% Ag, 10-20at% Si and 15-20at% Ca (for S2, S3 and S4). In sample S2, the dark phase has been analyzed by μXRD. Silver oxides have not been detected; the crystalline phase identified is calcite (CaCO3). In samples S2, S3 and S4, the light phase contains a greater quantity of both silver and chlorides: 55-60at% Ag, 30at% Cl, 10-15at% O). This light phase is found in the core and near the original surface (Figure 4). The light phase constitutes the layer which lies immediately below the original surface, and will be referred to henceforth as the inner layer. We also find corrosion products above the original surface, which constitute the outer layer. The composition of the outer layer and inner layer is different. The outer layer contains a higher proportion of chlorides: 45at% Ag, 45at% Cl. The corrosion products are probably composed of chlorargyrite (AgCl). Another difference between the inner layer and outer layer is porosity, the outer layer being more porous than the inner layer. SEM Picture in BSE (BackScattered Electron) of sample S2 (1: dark phase in mineralized core, 2: light phase in the inner layer, 3: outer layer, 4: resin). 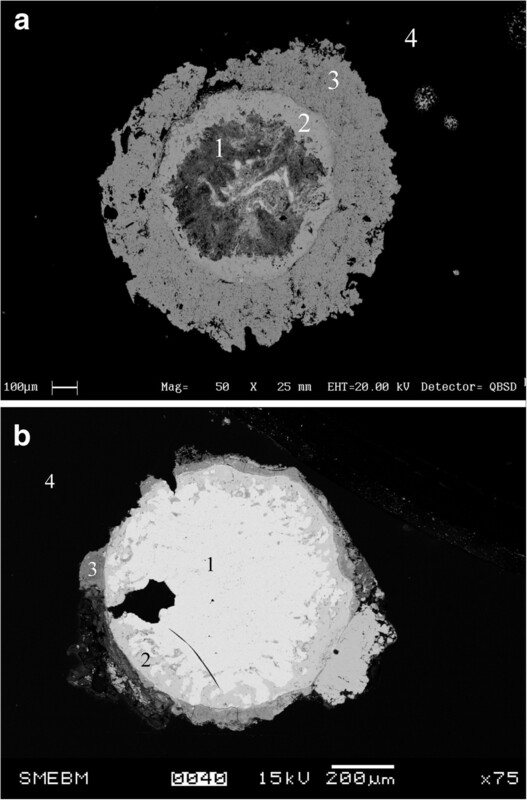 SEM Picture in BSE (BackScattered Electron) of sample S3: a- (1: dark phase in mineralized core, 2: light phase in the inner layer, 3: outer layer, 4: resin); b- the entire sample (1: metallic core, 2: inner layer, 3: outer layer, 4: resin). Other samples (S3, S6, S7 and S8) contain a metallic core (Figure 5b). These metallic cores are encased in an inner layer and outer layer of corrosion products. As in previous samples (S2 and S4), the inner layer is denser than the outer layer (Figure 6a). SEM-EDS analysis indicates a high silver content the in metallic cores: sample S3 contains about 5at% Cu; sample S6 has 3-4at% Cu; sample S7 contains about 3at% Cu and inclusions with Fe and Mg; in sample S8, we detected only traces of Cu: the silver is very pure.The metallic core may be partially oxidized, probably due to the development of corrosion. 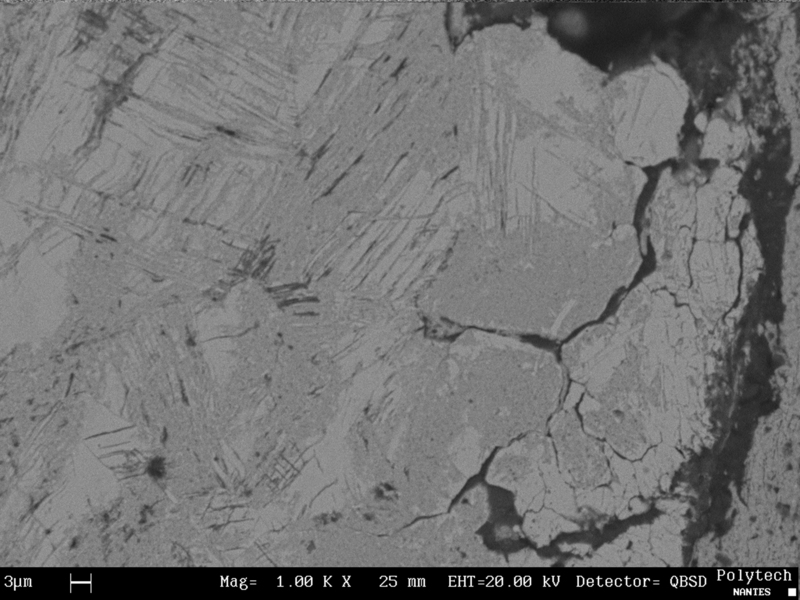 In sample S8, the inner layer is not homogeneous; some areas are not corroded because corrosion products develop more readily in given directions (Figure 6b). Corrosion appears to follow slip lines due to hardening. During the manufacturing process, this object (a spiral rod) underwent torsions causing it to harden. In sample S8, the inner layer contains mainly silver chlorides, and may be very fragile. In sample S3, S6 and S7 from another archaeological site, the inner layer mainly contains Ag, Cl and O. The high concentration of oxygen is always associated with other elements (Ca in S3; Si and/or Cu in S6 and S7). We also detected copper in the corrosion layer.In all samples (S3, S6, S7 and S8), the outer layer contains mainly silver chlorides. There are also soil markers (sediments: Al, Si, Fe …). Sediments can also form a thick layer on top of the outer layer (Figure 6a). The original surface is located between the inner dense layer and the outer porous layer. This localization is confirmed by the detection of the weld or of gilding: in sample S3, we were able to find the weld metal (Sn/Pb) on the original surface; in sample S6, a thin gold layer was detected on the original surface, which may correspond to gilding. SEM Picture in BSE (BackScattered Electron): a- sample S8 (1: metallic core, 2: inner layer, 3: outer layer, 4: sediment, 5: resin); b- zoom on the inner layer. 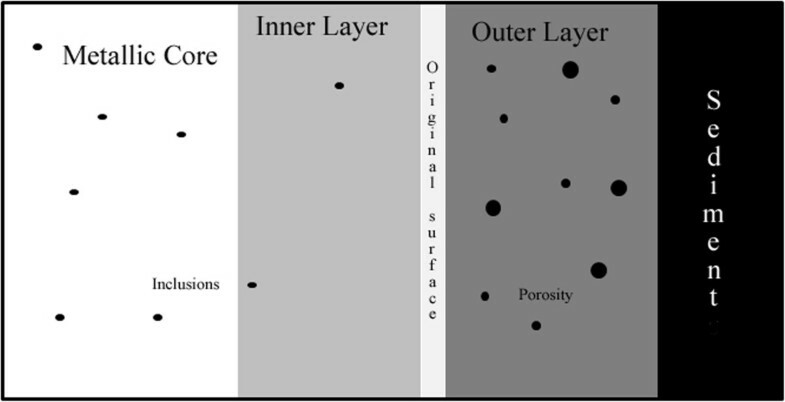 Results show that all objects display the same type of corrosion (Figure 7). The original surface is located between the inner layer and the outer layer. This localization of the original surface has already been reported by MacLeod and North . They also observed that cleavage between these layers was good, but failed to explain this phenomenon. This is in fact due to the variation in porosity between the layers. The outer layer is porous and is mainly composed of silver chlorides (AgCl) together with sediments (soil markers). The inner layer is denser and incorporates inclusions such as Cu. It generally consists of a silver chloride (AgCl) mixture and other phases containing oxygen. These oxygen-containing phases were not clearly identified as they are always associated with other elements (Ca, Si or Cu). Calcite (CaCO3) was detected in the dark phase of sample S2. Silicates and copper oxides may also be found, although the presence of silver oxides has never been proved. In sample S8, the inner layer is composed of silver chlorides only. This variation between S8 and the other samples can be explained by the difference in burial environments: objects S2, S3, S4, S5, S6 and S7 come from Saint Martin’s Church, whereas object S8 comes from the Gallo-Roman site of Rezé. MacLeod and North  have already referred to the connection between the formation of the corrosion products mixture (AgCl and Ag2S) and variations in the environment (anaerobic/aerobic). In our case, we did not detect Ag2S but a mixture of AgCl and another, difficult to identify, oxygen-rich phase. A better knowledge of this phase is essential to confirm the absence of silver oxides. Since AgCl formation requires the absence of silver oxides , it would seem unlikely that this dark phase contains silver oxides. This phase becomes more important when the object is completely corroded. Figure 6b shows a schematic diagram of corrosion with a metal core, but it can also be extended to completely corroded objects: in some objects (S2, S3 and S4), the inner layer has developed to the extent that the metal core has completely disappeared. Object S3 presents both profiles: the first sample taken from the object is completely mineralized (Figure 5a); whereas in another sample, the object still displays a metallic core (Figure 5b). When the metallic core is completely mineralized, the outer layer is much thicker: in Figure 5a, the outer layer measures about 250 μm; on Figure 5b, the outer layer is about 30-50μμm. We also observe that the oxygen-rich dark phase (with Ca, Si and Cu) is detected only in the mineralized core. Copper comes from inclusions in the metal and copper oxides are formed by galvanic coupling. Si and Ca elements were not detected in the metallic core of sample S3 in contrast to the mineralized core. This difference shows that the origin of these elements is not due to the manufacturing process but to the burial environment. Schematic diagram of the corrosion product layers resulting from horn silver artifacts. The formation of AgCl has been investigated by many scientific papers, but in other media and under different conditions. The formation of AgCl on silver electrodes has been specifically studied in chloride media [24–26]. Formation of the first layer follows an adsorption-desorption mechanism, then a thin film of AgCl grows due to diffusion. As the AgCl film is discontinuous, ion transport takes place via spaces between grains of AgCl. As the film thickens, the spaces between the AgCl grains close up and the ion transport occurs mainly via micro-channels running through the AgCl grains . In these studies [24–26], the thickness of the AgCl layer is of the order of tens of μm, and Ag+ ions are produced by the anodic potential. The formation of AgCl on archaeological silver objects occurs under different conditions. 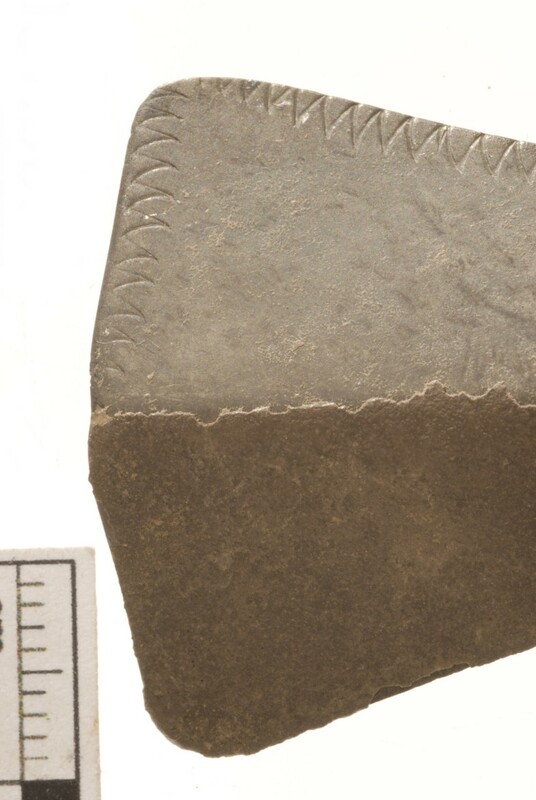 Accelerated corrosion tests were conducted to study the corrosion film observed on archaeological objects [14, 23], but these standard test samples also had a fine layer of corrosion products. Removing the protective oxide film is necessary to support the formation of silver chloride. In our analysis, we did not identify the presence of Ag2O. Jaro M.  suggested that in burial conditions (e.g. in crypts or graves), ammonia dissolves silver oxides, and silver ions react to form silver chloride, chlorargyrite (AgCl). Organic decomposition products (ammonia, nitrates, acetic acid, H2S) favour the initial corrosion process . Silver chloride does not create a protective layer, thus the metal can be completely transformed into silver chloride. Horn silver has bilayer films that correspond to the corrosion process as identified by Payer et al. . A generalized model for this corrosion system is presented for metals in chloride solutions. Corrosion products form 2 layers: a porous outer and a compact inner layer. According to Payer’s model, corrosion is initiated by the protective layer becoming non-protective. In the case of horn silver we examine, it is thought that ammonia may have destroyed the silver oxides in the burial environment . This new non-protective layer then becomes an inner layer. A thicker outer layer then develops through the precipitation of soluble species (e.g. sediments) and further reaction of corrosion products (AgCl). The porous outer layer can permit the penetration of water and the diffusion of Cl. Cations are produced by the oxidation of metal at the metal/inner layer interface. High ion transport in the inner layer allows for the growth of corrosion films: Ag+ cations diffuse to the outer layer, and Cl- anions diffuse to the inner layer. Copper inclusions do not seem to modify the corrosion mechanisms of horn silver. When copper is an alloying element (Sample S5), copper corrosion products are found in the corrosion layers. Otherwise copper inclusions are found only in the inner layer (and in the dark phase). Copper may play a local protective role through galvanic coupling. However, pure silver samples, such as S8, or samples with 2-5at% copper are subject to the same corrosion system: a compact inner layer and a porous outer layer of AgCl. Horn silver artefacts have a specific corrosion system: the surface is deformed by dull grey corrosion products. The objects are weakened and sometimes entirely mineralized. Artefacts displaying this corrosion system are few and far between because the corrosion process requires specific conditions. The opportunity to analyze and observe several horn silver objects is exceptional. We studied the different layers of corrosion products and formulated a corrosion process. The inner layer is formed with chloride by the disappearance of initial silver oxide layer. This AgCl layer is not protective and there is a high level of ion transport. Below the original surface, the inner layer is compact and contains other oxygen-rich phases. Above the original surface, silver chloride precipitates in the porous and larger outer layer; it incorporates soil markers. The difference in porosity between the outer and inner layers ensures good cleavage on the original surface. The authors would like to express their gratitude to archaeologists, Daniel Prigent and Marie-Laure Hervé, for providing horn silver artifacts. We also wish to thank Francois Mirambet for his μ-XRD analysis. We are very grateful to Clémence Cauvin, the student who participated in this work. Geraldine Marchand: she made analyzes and experiments. Elodie Guilminot:she supervised Marchand's work, and she drafted the manuscript. Stéphane Lemoine: he worked on the archaeological horn silver objects. Loretta Rossetti: she worked on the archaeological horn silver objects. Michelle Vieau: she worked on the archaeological horn silver objects. Nicolas Stephant: he participated in the SEM photos. All authors read and approved the final manuscript.